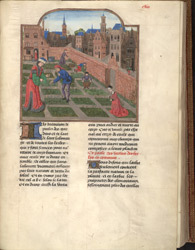 This illustration of a herb garden comes from a late-15th-century manuscript copy of ‘Le Luire de Rustican de prouffiz ruraulx’, a treatise on agriculture. The original text was written in Italy in Latin. It was one of the many works translated into French by command of King Charles V during the 13th century. Herb gardens generally followed the arrangement pioneered in monasteries. A 9th-century plan of an ideal monastery, drawn up at St Gall in Switzerland, still survives. It shows four gardens, one being the herbularius laid out close to the infirmary. Bede, the famous Anglo-Saxon monk, gives advise on monastic kitchen gardens in his 8th-century writings. Abbot Strabo of Riechenau listed the plants he grew at his abbey in the first half of the 9th century. They included sage, fennel, rue, lovage and chervil. The timing of planting and harvesting herbs often had symbolic as well as practical significance. One author in the 14th century recommended sowing parsley on St John’s Eve in June and cutting it only in the evening or early morning.